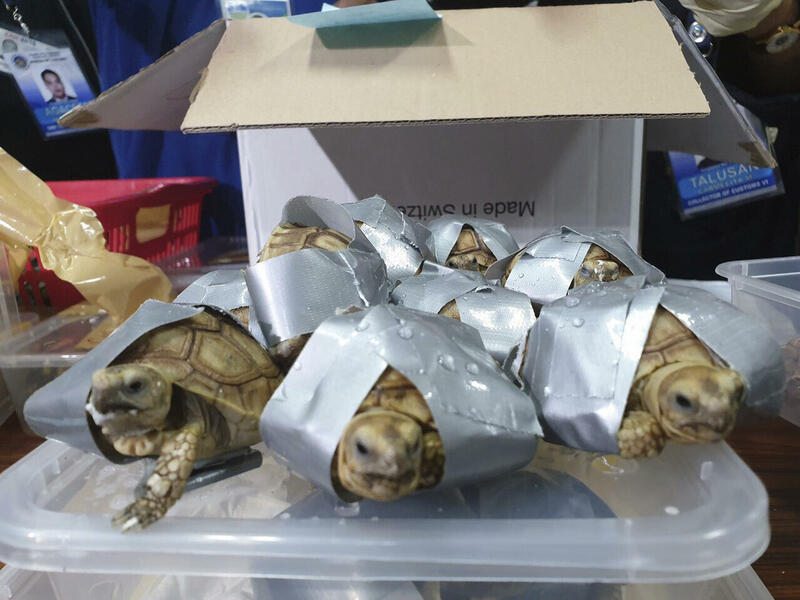 Filipino authorities said that they found more than 1,500 live turtles and tortoises stuffed inside luggage at Manila's airport. The items were left behind by a Filipino passenger coming from Hong Kong, the Philippine Bureau of Customs said in a statement. It's not clear why that passenger abandoned the animals in the airport, though the customs bureau has a guess: "The passenger may have been informed of the vigilance of the port against illegal wildlife trade and its penalties." In the Philippines, convicted wildlife smugglers can face prison time of up to two years and a fine of up to 200,000 Pesos (about $3,850). The smuggled animals included Star Tortoises, Redfoot Tortoises, Sulcata Tortoises, and Red-eared Slider Turtles. They've been turned over the officials from the Department of Environment and Natural Resources who monitor wildlife trafficking. "Turtles and tortoises are often kept as exotic pets, but are sometimes also used as a form of traditional medicine or served as a delicacy across parts of Asia," the BBC notes. "Their meat is considered by some to be an aphrodisiac, while the bones are powdered for use in medicine." They were found on World Wildlife Day, as Philippine news website Rappler reported. The various types of turtles were found Sunday inside four pieces of left-behind luggage of a Filipino passenger arriving at Ninoy Aquino International Airport on a Philippine Airlines flight from Hong Kong, according to customs officials. Discoveries of smuggled wildlife are not uncommon in the Philippines. 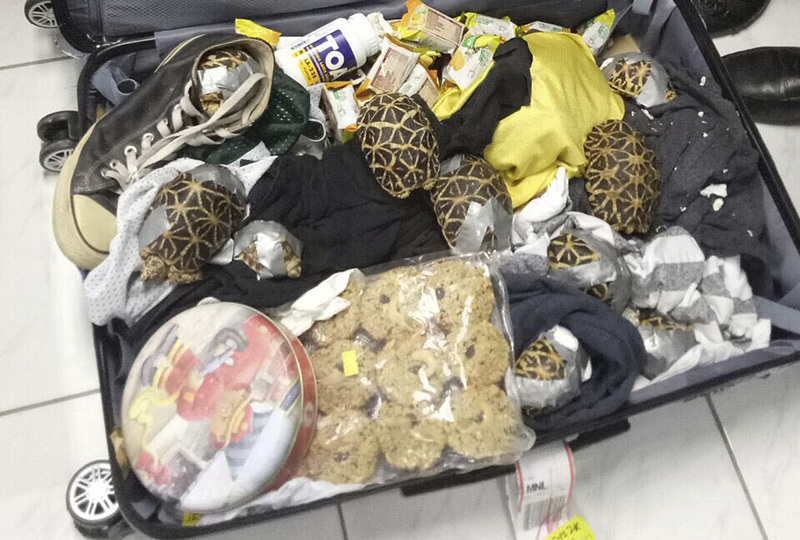 Customs authorities said last year, they turned over "a total of 560 wildlife and endangered species including the 250 geckos, 254 corals and other reptiles," that were found in "air parcels, baggage and shipments." Earlier this year, Filipino customs officials found "63 Iguanas, Chameleon and Bearded Dragons." Turtle smuggling is also an issue in nearby countries. The BBC reported that "last week, 3,300 pig-nosed turtles were smuggled into Malaysia by boat - though this attempt was intercepted by Malaysia's maritime agency."